In a 60 Minutes interview, Jeff Bezos announced that Amazon is working on delivery that's even faster than Prime. The company wants to use octocopters to deliver your order within a half hour. Bezos says that the project, which is heavily in the R&D stage right now, couldn't debut before 2015 even if Amazon were ready because of FAA regulations, but even then PrimeAir will probably still be a few years out. Bezos estimates that it will be another four or five years. He told 60 Minutes, "It will work and it will happen, and it's gonna be a lot of fun." The goal is for PrimeAir to do quick and light deliveries (Bezos called out kayaks as an item that the drones probably won't be able to handle) around something like a 10-mile radius. The drone fleet would be greener than using trucks because it would be all electric, and people's stuff would find them wherever they were based on GPS coordinates they entered at checkout. It's not much of a stretch to think about the service using phone tracking so a PrimeAir drone could deliver extra tupperware to whichever grassy knoll your picnic ends up on. Amazon VP Dave Clark said during the segment that, "Anything you want on Earth you're gonna get from us. That's where we're headed I believe." And this would definitely be a step toward anything, anywhere, anytime. 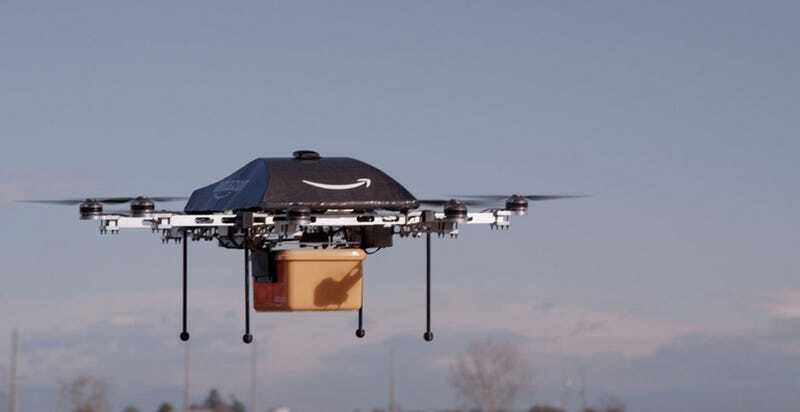 But Bezos cautions that Amazon has to get safety nailed before the company can unleash a swarm of drones on the world. "This thing can't land on someone's head," he noted. Famous last words, Jeff.